If you haven’t already checked out our first two articles on posture, click here and here to read them. 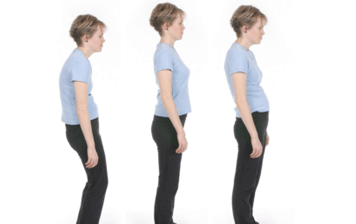 These postural exercises and stretches are designed to help improve your upper body posture. But, how do you know whether you need to be performing them? An easy way to figure this out is to stand in front of a full-length mirror, relax your shoulders, letting your arms dangle, and look at the direction that your palms are facing. If your palms are facing each other exactly, parallel to each other, congratulations you most likely have excellent upper body posture. More likely, however, if your palms are facing slightly backward, like the woman in this photo, or completely backward, then your shoulders are internally rotated, which is consistent with upper crossed syndrome. You would be a good candidate for both stretches and exercises to relax the pectoralis muscles and strengthen and remove the inhibition of the rhomboid muscles of the back. The absolute best way to determine whether you have a postural problem, however, is to have a postural analysis done by a professional. At North Jersey Whole Health Center, in Englewood, New Jersey, Drs. Press and Geleta can perform a very quick postural analysis and determine whether a course of exercise and gentle chiropractic care is appropriate for you. Call 201-569-1444 for an appointment today!